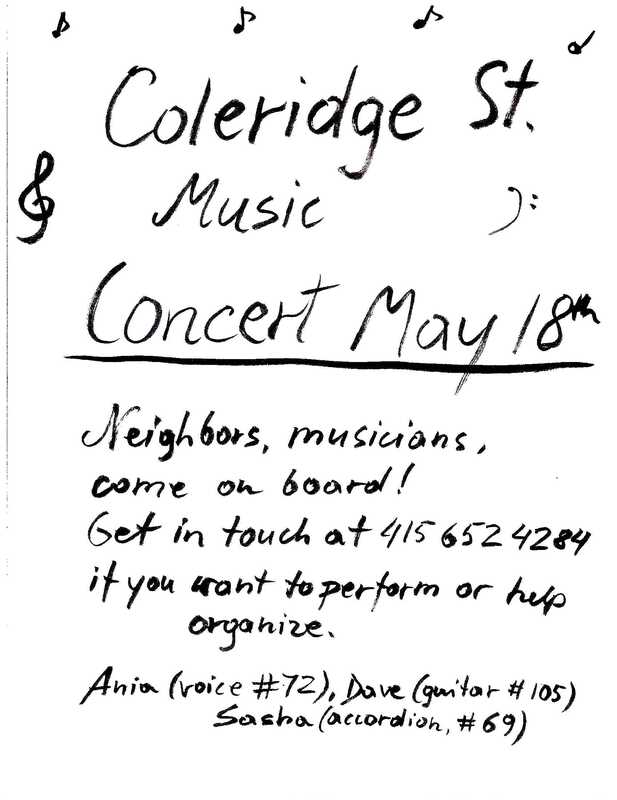 Concert in Coleridge street on May 18th! Bernal Opera is co-organizing a music event in Bernal Heights. A few weeks ago a disturbing event happened in our street, reported here on our local blog Bernalwood. Shaken by the event in our normally quiet and friendly part of the world, some of us neighbors decided to give Coleridge street back its good name by making music. Which plays here anyway thanks to Sasha! Last Monday the organizing committee convened and set the date for Sunday May 18th, 12-3, rain or shine, at the Minipark; barbecue, mimosas, the works! So far we have a guitarist, an accordionist, a ukelele player and a singer. Wanna join in – get in touch!